• Structure ID: NBI 000043000109983 (IL), 000000000023880 (IA). • Location: River Mile 579.3. • Daily Traffic Count: 26,700 (2002). • Bridge Type: Continuous Steel Arch Truss With Suspended Deck. • Length: 5,760 Feet Overall, 845 Foot Main Span. • Width: 28 Feet, 2 Lanes. • Navigation Channel Width: 803 Feet. • Date Built: Opened 1943. 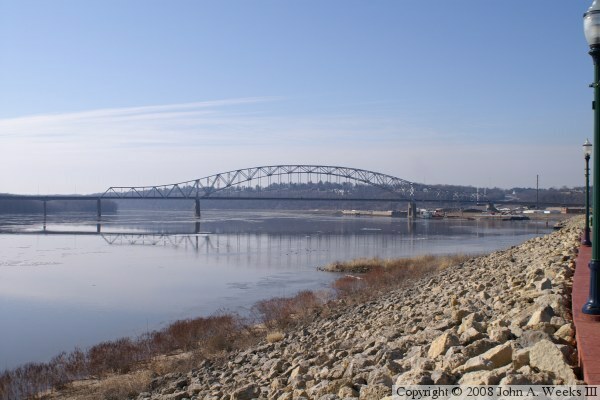 The US-20 river crossing was built to provide access from Dubuque to northern Illinois. 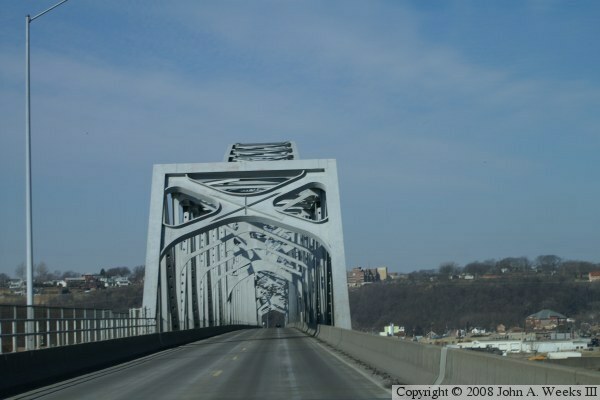 When the Eagle Point bridge was downgraded, US-61 and US-151 were rerouted across the Julien Dubuque bridge. A new freeway crossing has since opened just upstream, which now carries US-61 and US-151. 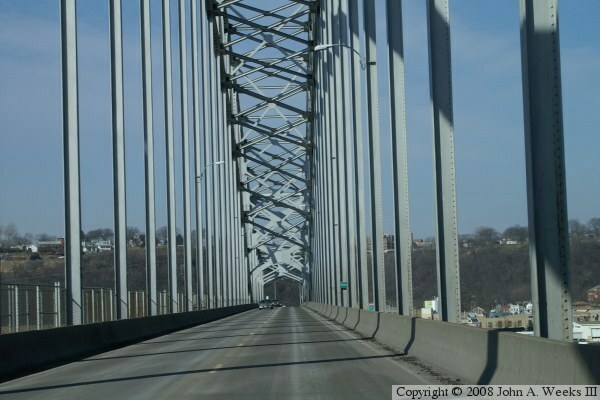 The Julien Dubuque bridge is only 2 lanes, and it has significant traffic backups. There has long been talk of building a 2nd span, replacing this bridge, or building a new US-20 freeway bridge a few miles downstream. This would likely be best accommodated by projects to upgrade US-20 to freeway across northern Illinois to Rockford, and a southern bypass around Dubuque. 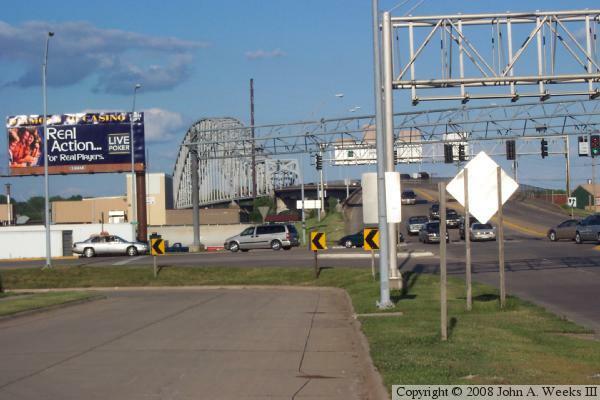 In late 2005, funding was secured to start the construction of a twin span just south of the existing bridge. Given that this bridge is considered to be an architectural landmark in Iowa, the new bridge will hopefully be built to look the same as the existing span. Locals refer to this as the High Bridge, while the former Eagle Point Bridge was called the Toll Bridge. The High Bridge name is somewhat of a throwback from the previous bridge at this location, the former High Wagon Bridge. The bridge was opened during WWII. Builders were paranoid that Germany would seek to blow up the new bridge, so it was painted gray as a camouflage. Later, the bridge was painted dark green. It stayed that way until the early 1990's, when it was returned to its historic gray color during a renovation. The bridge was a toll bridge from 1943 until 1954. According to the Iowa DOT, the bridge superstructure has 1,925 tons of silicon steel and 2,292 tons of carbon steel. The approach spans used 3,205 tons of steel. The substructure required 34,087 cubic yards of concrete, 1,232 tons of steel, and 2,909 timber piles. Total cost in 1943 was $3,175,341.63. When built, the 845 foot main span was the 2nd longest over the Mississippi River, 4th longest in the USA, and 8th longest in the world. 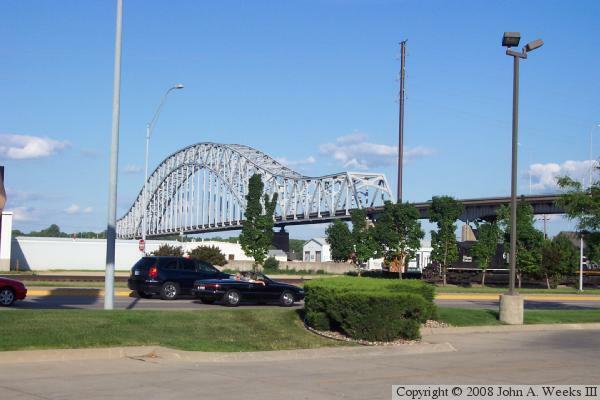 The Julien Dubuque Bridge is now listed in the National Register of Historic Places. 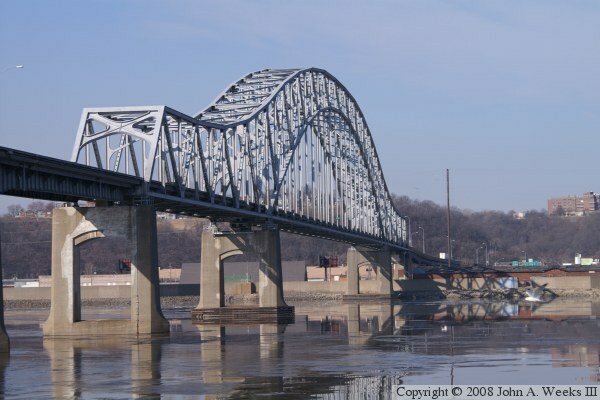 The Julien Dubuque Bridge was closed for 18 hours on the evening of June 9, 2008, when it was struck by a river tow. Three barges hit one of the main span piers. One barge became lodged against the concrete pier and began to sink. The other two became stuck near the bridge. The remaining 12 barges got loose and stuck other barges along the Mississippi River shoreline. The barges were carrying iron ore, corn, and soybeans.